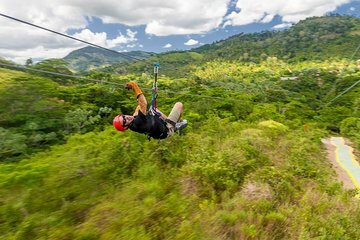 Combina la zipline, una visita alla casa del cocco e una sosta a Monkeyland durante questa escursione di 9 ore da Punta Cana. Sono inclusi tutti i biglietti d'ingresso, il trasporto di andata e ritorno da hotel selezionati e un pranzo a buffet. Inizia la tua giornata di avventura con un comodo prelievo dall'hotel intorno alle 08:30. Con il tuo gruppo, sali su un fuoristrada da safari e viaggia nell'entroterra dominicano, diretto alla struttura di zipline. Il tragitto dura circa 45 minuti. Ascolta le guide della zipline che forniscono un briefing sulla sicurezza e l'orientamento, quindi indossa casco e imbracatura. Metti alla prova le tue abilità in una linea di pratica, quindi sali sulla prima piattaforma e lanciati. Sfreccia lungo 12 linee tese tra 18 piattaforme tra le chiome della foresta. Dopo l'avventura sulla zipline, prosegui verso la casa del cocco, dove potrai imparare come viene prodotto l'olio di cocco e assaggiare alcuni prodotti locali come cacao, caffè e frutta tropicale. Quindi, fai una visita guida a Monkeyland, un santuario gestito da una coppia canadese con oltre 35 anni di esperienza di lavoro con gli animali. Guarda i saimiri giocare e mangiare in una zona di 2 ettari. Ricaricati con un tradizionale buffet dominicano al Mountain Ranch prima di tornare a Punta Cana per il rientro in hotel. This was an awesome day! All of the activities were a blast and our guide Sammy was terrific! Definitely recommend for all. HIGHLY recommend this excursion! An awesome time with tons of ziplining fun and the monkeys are so stinking cute! After looking at numerous sites and reviews, we booked through Viator. We got picked up at our hotel at 11am, which we we're worried at first since we had dinner reservations at 8 and thought it was a 9 hour trip in total. But we talked to Wilber and he set us up with another driver after we ziplined since we were doing Monkeyland next. If you do both you won't be disappointed. Ziplining was fun and I found out I need more cardio, Lol. You go from one to another and if it gets to be too much you can go back early and wait. After ziplining we had a Dominican meal, which was a HUGE spread, and music by locals. Tipping is a must, the ladies cooked and everything was delicious, also tip the musicians. We went on to learn about how coffee is made and cocoa. Got to sample fresh grated cocoa with sugar cane and cinnamon, they put in your hand to eat. Also, tasted coffee if you wanted and hot chocolate and mamajuanna a local root, wine, rum and honey drink. There are spices, honey, cocoa butter and so much more to purchase, which we did. Monkeyland was next and it was so beautiful looking over the mountains and feeding the monkeys. You get a bowl of fruit and nuts and they just jump all over you, we got many pictures and purchased pictures from them. All in all is was worth the money, it's once in a lifetime experience. everyone was nice and friendly and comical. This was a highlight of my stay in DR!It started off with a lady being rude when I called 8295997444 to let them know i was in lobby and make sure they didnt leave due to me having no phone service in Dr.I was picked up the time indicated in the email day before and once I tranferred cards things got great!My driver Virgilio and Hamlet tour guide were great. Driving well and keeping us safe,while Hamblet was funny informative and helpful and energetic. The zip line crew was exceptional they made me who was terrfied feel safe and comfortable the whole time!They even asisited my daughter whobis a very small 5 yr old by riding 10/11/12 line with her.They allowed take pics before going on lines never while on lines.Thank you guys The guy who makes funny noises and gives the coco introduction and cocunut oil display was gunny and imformative and made it interesting. Omg the monkeland was great!The monkeys were nice friendly and hungry!They are light and cute.The picture men both zip line and monkey land do great jobs with pics!This was a adventure well never forget thank you all at runners adventures!Make sure u have 10 cash to rent a locker before going zip lining u get 10 back. They take debit cards for everything else except that. Well worth the price. This was a great time for us! The trip to the mountains was beautiful once we got past the Hotel pickups which can be tedious so be patient. These guys were great! On the trip up there once we were on the right transport! Our Guide was Sammy and he gave us some insight into history of the land the economy of Cacao, Coffee, and MamaJuana. The farms were picturesque with healthy grass-fed livestock. The Zipline was well run and fun, and multilingual Big Willie and his team made for a great time! We then boarded the bus around the corner to and really nice spot for a traditional Dominican Lunch or you could say dinner with all the food!. The chicken in the amazing sauce, beef dish and rice with some fruit. Lots of genuinely great food! The it was around the corner to Monkey land, where we got to feed and hang out with these guys in a beautiful garden like place, with lots of shade to stay cool and take photos. The guy who run the place love the Monkey's and they are well taken care of here, the caretakers are very professional and the place is welcoming and clean. We finished up in the afternoon at the Cocoa house and Sammy gave us some education into how its all done there and it was fascinating and tasty. We brought some home. So aside from Hotel pick up stuff this is a great tour. Special thanks to Sammy and our driver Adolfo, Nice job guys! This was AMAZING and the price was very reasonable. It was our favorite excursion while we were in Punta Cana and look forward to doing it again with our daughter. Fantastic tour! We visited Dominican March 12-19, 2018. The open air transportation picked us up at our resort in Punta Cana on time. 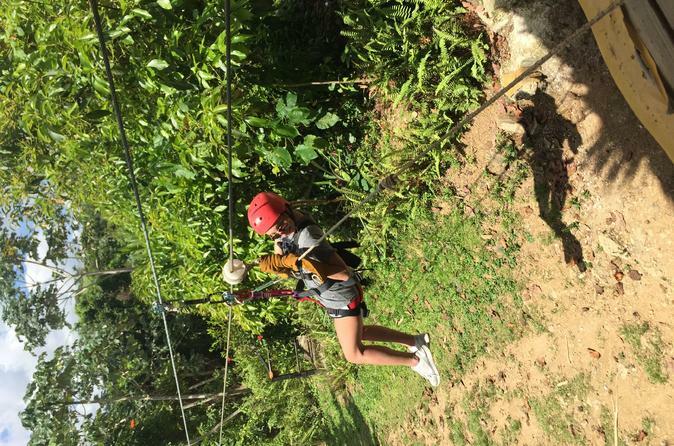 We traveled approximately 45 minutes through the Dominican countryside to the ziplining location. On the way, we were able to get a glimpse into Dominican culture. We drove through several small towns and our guide shared information about the communities and the people. The only negative about the transportation is that because the vehicle is open, you are constantly breathing in diesel fumes. Most of the cars in the DR are fueled by diesel, due to the price of gas. On the flip side, you are on vacation and it was fantastic to feel the warm tropical air in your face! Ziplining in the mountains was unbelievable. It was difficult to focus on how thrilling the ziplines were, as the scenery was absolutely stunning! There were 12 ziplines in total. You are literally soaring over jungle, rivers, and palm trees! After ziplining, we enjoyed a delicious Dominican lunch and learned how the locals make chocolate, coffee, rum, and coconut oil. We even got to sample the goods! In the afternoon, we headed to Monkeyland. WOW. We literally had squirrel monkeys crawling all over us. They were so cute, and we were able to take some spectacular photographs. There was a guide there taking photos, but there was no pressure to purchase them. You are encouraged to bring your camera and snap as many pictures as you like. Initially, this excursion seemed a bit pricey, but in my opinion, it was worth every cent. If you love adventure and experiencing new culture, I highly recommend this excursion. It really was an adventure. My husband and 11-year old daughter also had the time of their life! Die Tour war super! Leider wurden wir eine halbe Stunde zu spät am Hotel abgeholt, dies resultierte aber dadurch, dass unser Komplex 5 Lobbys hatte und man da schnell den Überblick verlieren kann :- Beide Teile waren sehr interessant. Die Guides waren nett und locker, haben alles gut erklärt. Die komplette Tour war interessant, das Essen sehr lecker! Kann ich nur empfehlen! Mimi was an amazing tour guide! I highly recommend this trip to anyone! Will definitely do it again in another country! Ziplining was great also, for someone afraid of heights, i overcame them for this and highly recommend this as well! If it was possible, I'd give this tour a 10/5. There was a little more driving than expected, but it was well worth it. We got picked up at 715 by a safari style truck. We made 1 stop and picked up another couple. Then we made another stop and transferred to a bus where we joined a larger group. After that, we made 2 more stops to pick people up. With us being the first people picked up, it was about 1 hour and 45 minutes of driving. However, Mimi the tour guide, was AMAZING and made the time fly by. After getting all passengers on the bus, we headed for the zipline area. As we drove through a local village, Mimi pointed out a local school, a local church, where the locals sell gas, and a lot of other interesting points. He worked well with the driver Cedano and we pulled over a few times just long enough to get a picture of the local scenery. We finally made it to Ziplines and the view was INCREDBILE. We did a quick class to make sure we all knew the basics, then we started. Ziplines start off short about 200 feet and grow longer as you go the longest is about a 1/2 mile. I've included a photo, but can't include any of my videos. There are a total of 12 ziplines along 18 platforms. There is also a quick jump which is essentially a bungee cord except you don't bounce when you get to the bottom. You're basically jumping to a cushion below. Everyone there was super friendly. Willy had a great sense of humor. As you go through the zip line, they'll take your picture. You can buy a picture at the end of the course. After completing the zipline, we went to a local farmer's house and saw how cacoa and coffee are grown/harvested. Mimi explained everything, and walked us through the process. We were able to see beans as they dried, and we were able to taste cacoa straight from the plant. It was really incredible. While there, we were also able to try chocolate powder, coffee, hot chocolate, coconut, and mamajuana. The people working are really nice. They do have lots of items for sale. When we finished with the local plantation/farmer tour, we went to a local dominican buffet. I was surprised with how good the food was. There was rice, beans, 2 different types of chicken, fruits, salads, and beef. There was also local music played throughout the lunch. There isn't much to say about the buffet. Next, we were off to Monkeyland which was probably the best part of our entire honeymoon. First and foremost IF YOU HAVE A SEVERE PEANUT ALLERGY YOU CANNOT GO IN!! I wanted that to be clear as we had someone who made it all the way to Monkeyland before realizing she wouldn't be able to go in. We went into monkeyland and it reminded me a bit of Birds by Alfred Hitchcock. As soon as we passed through the first door, the monkeys came running because they knew we'd be feeding them. We got a quick lesson from the guides, then we were given bowls of fruit and nuts. The monkeys are super friendly and didn't hesitate to come to us. You have to be prepared- the monkeys won't hesitate at all. They jump on your head and arms. They'll sit on your feet while eating. I even had 1 monkey trying to go through my pockets. The tour guides were really nice and very informative. There were some pretty great moments, but it's really something you have to experience for yourself. What I can tell you is that there were a lot of laughs, a lot of great pictures, and a lot of fun. As you go through monkeyland, they'll take a family picture with you. You can buy the picture for 10 at the end that's 10 PER picture, but some of the proceeds do go to local education. To be honest, I really can't say enough about this trip. it was EASILY the highlight of our honeymoon. We felt completely safe throughout the entire trip. We loved all of the staff involved, and we loved every minute of the adventure. The long ride back offered a good chance to get a nap as well.